The scandal around openly fascist statements made by Croatian Minister of Culture Zlatko Hasanbegović sheds new light on Croatian society’s struggle to deal with the country’s past and the genocide committed against Serbs, Jews and Gypsies by its fascist regime in World War Two. Many still rever the Ustaše and have no problem showing it. „The Ustaše were heroes, martyrs and šehidi (Muslim martyrs)“. This is a statement Zlatko Hasanbegović wrote in a commentary for a neofascist monthly in 1996. In the same article he practically advocates Croatia should annex all of Bosnia – one year after among others the Croatian government had recognized the inviolability of Bosnia’s borders and Bosnia’s indepedence in the Dayton Accords that ended the war in Bosnia and Croatia. “In the name of those true heroes… who gave their lives for our Homeland… we, the true Croatian nationalists… the deceived and defeated Muslims and Catholics, should expose those hypocrites and moral freaks for who they really are, and show the people the way out of this dark tunnel towards peace and unity and religious tolerance which can only happen in a truly free and unified Homeland, stretching from the Mura, Drava and Drina rivers to the Adriatic”. Zlatko Hasanbegović in a commentary, 1996. Those statements were long forgotten until three days ago when the Croatian Magazine „Novosti“ published them in a lengthy and well investigated article that demonstrates how deeply entangled with openly neofascist movements Hasanbegović has been for decades. According to „Novosti“, Hasanbegović even became leader of the youth faction of the Pure Party of Right (HSCP), one of the numerous neofascist organizations he was active in or sympathized with at the time. In an article featured on the HCSP’s official website it is claimed that the organization gained additional strength and membership precisely during Hasanbegović’s tenure“, „Novosti“ writes. His contacts included members of Ante Pavelić’s family, the leader of the fascist Ustaše that ruled the so called Independent State of Croatia (NDH), a close ally of the Third Reich during WW II and responsible for the deaths of at least 600.000 people, mainly Serbs, Jews and Gypsies. The NDH also included Bosnia and parts of Serbia. 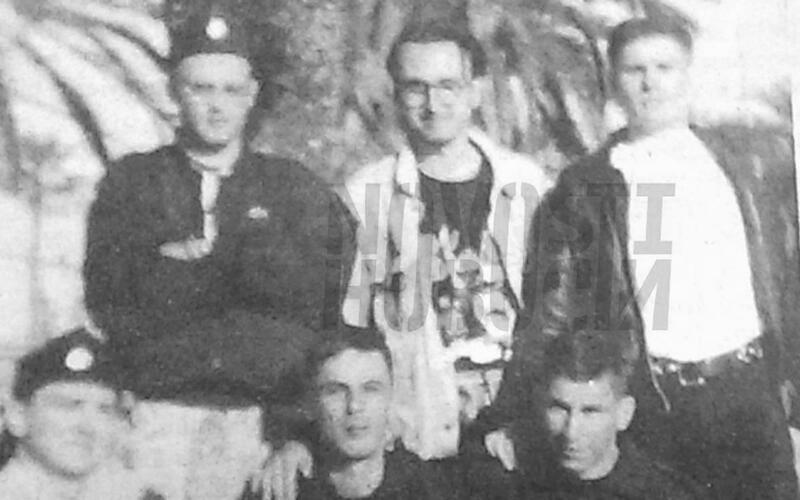 Also, several photographs show Hasanbegović in the company of neofascist politicians, on at least one occasion he even wears an Ustaša cap. The new Minister of Culture in Croatia’s new right wing government has never distanced himself from his past. Hasanbegović Goes To Jasenovac. Or Not. The evidence dug up by „Novosti“ has lead to what the Croatian paper „Sloboda Dalmacija“ has called a „media tsunami“ in Croatia, forcing Hasanbegović to announce the he „will go to Jasenovac“, the site of the Ustaše’s main concentration and extermination camp. Hasanbegović had previously denounced the annual commemorations held at Jasenovac for the victims of the NDH as not serving the victims but legitimizing Yugoslavia’s communists in a TV show hosted by Velimir Bujanec, former head of one of the extremist parties Hasanbegović was entangled with. According to the Croatian daily „Jutarnij list“ Hasanbegović denies he ever made such statements. One of those institutions that think the denial is less than truthful is the Simon Wiesenthal Center. Its director Ephraim Zuroff has publicly called for Hasanbegović’s dismissal from his government post. He did this two weeks ago, not aware of the new evidence „Novosti“ revealed a couple of days ago. While the affair puts Croatia’s Prime Minister Tihomir Orešković representing the nationalist conservative Party HDZ under pressure (he had previously called Hasanbegović an antifascist), it highlights just how deep rooted sympathies for fascism and neofascism are in large parts of Croatian society. Just after Christmas hundreds attended a mass for Ante Pavelić, Croatia’s „Poglavnik“ (Führer) in WW II at the Cathedral in Zagreb. It is a safe assumption that those devout Catholics didn’t pray for Pavelić’s sins, the genocidal terror regime he was in charge of, to be forgiven but rather commemorated a man who they rever as hero. It wasn’t the first time such a mass was held, as the investigative online magazine „Balkan Insight“ reveals. Last year however, dozens of Croatian antifascist activists protested the mass, claiming hooligans attacked them before the protest started. And „some of the people who gathered in front of the church before the service made Nazi salutes at the protesters and called them ‚Serbs'“, writes „Balkan Insight“ in a report. The Roman Salute, the raised right arm, palms down and fingers held together, also known as Nazi salute is a common sight in modern day Croatia. Croatian antifascists regularly document people giving those salutes in public. Moreover, many people have no qualm uttering the Ustaša slogan „Za dom spremni“ (Ready for [the] home[land]). While not happening on a daily Basis, it has become a regular orruence in soccer stadiums, provoking international scandals. Last year alone, two such incidents have been reported, one during an international youth match. In spite of occasional protests by international organisations such as UEFA, FIFA or the Wiesenthal Center, there is little international pressure on Croatia’s politics to do much about the openly fascist subcultures in the midst of Croatian society. It seems unlikely that the problem will be tackled without outside pressure, though. In an interview with the German newspaper „Frankfurter Rundschau“, Croatian theater director Snježana Banović sees the country at the wake of what she calls a „mental civil war“ that would eventually involve the entire population. While only a minority of Croatians openly sympathize with neofascist movements, anti-Semitic resentments are widespread. Up to a third of the population harbors anti-Semitic views, according to a survey by the Anti Defamation League. Strangely, this view is often accepted abroad. The Croatian fascists (Ustaša), vasalls of Hitler and Mussolini, rule with utmost brutality. Jews, Gypsies and political opponents are persecuted, arrested and detained in a concentration camp near the river Sava and killed. Never once does the book mention Serbs who numerically were the main victims of the Ustaša genocide. Nor does it mention the name of the „concentration camp near the river Sava“: Jasenovac. That revisionism is so widespread has several reasons. For most of Yugoslav history, the crimes of the Ustaše (and Serbian četnici) was something that wasn’t really talked about. Both groups were portraited as villains (which they undoubtedly were) and opponents of the Partizans but what they actually did and how wasn’t really analyzed, not even by historians. The first memorial site in Jasenovac wasn’t opened until 1968. Yugoslav leader Josip Broz Tito feared that an open discourse about the crimes would endanger the concept of „bratstvo i jedinstvo“, of „brotherhood and unity“ with which he hoped to overcome nationalism and unite the country. Former Ustaša war criminals and officials in exile also played a prominent role in funding the start of Croatia’s nationalist party HDZ in the late 1980’s. The party and its first leader Franjo Tudjman, who was to become the first Croatian President in independent Croatia, are credited with the nation’s independence in 1991 by large parts of the population. With few exceptions, HDZ has been in power ever since 1991. While not being neofascist itself, HDZ officials are said to often have turned a blind eye to openly neofascist movements. After independence, the genocide against Serbs, Jews and Gypsies in the NDH was a subject historians and conservatives tried to avoid as best as the could. They feared not only that this would de-legitimize the new country but also that it would legitimize Serbian warfare. After all, it was the genocide against Serbs that Serbian politicians used as a legitimization and mobilizing factor when they had several territories with a Serb majority population declare their independence from newly independent Croatia and later Bosnia in order to re-join Yugoslavia. Only in a rump Yugoslavia (or Greater Serbia) would they be safe from another genocide, Serb nationalist warmongers claimed. It was this stance that prepared for the „ethnic cleansing“ that ensued and characterized the civil war in Croatia and Bosnia. While „ethnic cleansing“ wasn’t an exclusively Serb war crime, according to all records it was Serb militia and members of the (Rump-)Yugoslav army JNA that committed the bulk of war crimes during the war. Croats that engaged in „ethnic cleansing“ often invoked the heritage of the Ustaše. The fascist past is like a festering wound in Croatian society. Every once in a while, when too much ooze has accumulated and breaks open. To date, it has not been cleansed. It is unlikely that the Hasanbegović affair will lead to the cleansing that is necessary for that wound to heal. To date, there has been no international outcry following the revelations of „Novosti“. Come Monday, that might change. However, even should he be dismissed, this would not change the appeal fascist and neofascist ideas have for many Croatians. It would take a national effort that would have to include an open debate about the heritage of WW II. After 70 years of silence this does not seem the most likely outcome of the affair. Title Photo: Zlatko Hasanbegović (center, front) surrounded by fellow functionaries of the neofascist party HOP in a party publication. Photo source: Novosti. A good summary of the current situation. I also think Hasanbegović has to dismiss sooner than later. One minor correction: As far as I ca see Tihomir Orešković is not a member of the HDZ but he was elected as consensus candidate of HDZ and MOST having no party connections before. Thanks. I corrected that to Orešković representing HDZ. I think it’s a safe assumption a PM represents the strongest party in gov’t one way or the other.